Action continued to heat up in the 2016 PBA Commissioner’s Cup as GlobalPort and Blackwater bounced back from earlier defeats to notch their first wins of the conference. The Elite trounced Mahindra in the first game, while the Batang Pier frustrated the Gin Kings in the main offering. 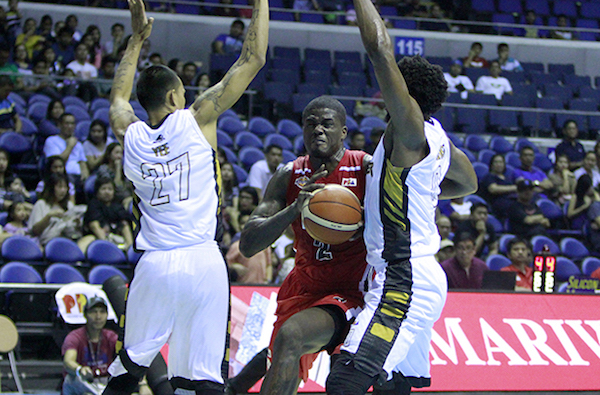 The Blackwater Elite picked up their first win of the conference after outdueling the Mahindra Enforcers, 110-102, in the 2015 Oppo PBA Commissioner’s Cup on Valentine’s Day Sunday at the SMART-Araneta Coliseum. Carlo Lastimosa, who scored a career-high 39 points in the Elite’s conference opener, put forth a solid encore, finishing with a team-high 26 points and six rebounds in this one. Reil Cervantes added 24 points – 18 of those in a terrific fourth quarter performance for the Blackwater forward. Rookie Art Dela Cruz also had a strong showing, scoring 19 points on 8-for-13 (61%) showing as well as four steals. Cervantes and Dela Cruz combined to make six three-pointers. Blackwater import MJ Rhett had 19 points and 18 rebounds, while Mahindra’s Augustus Gilchrist posted 34 points and 14 rebounds in the match-up of reinforcements. KG Cañaleta seems to have risen as one of Mahindra's top guns. MJ Rhett rebounded from a lackluster debut by pouring in a double-double for the Elite. It was Blackwater’s second win over Mahindra this season after winning their head-to-head matchup in the Philippine Cup last conference. The two teams entered the league as expansion teams together last season. Karl Dehesa finished with 14 points, while KG Canaleta had 13 for the Enforcers. MJ Rhett (BLA) - 19pts, 18rebs, 3asts, 2blks, 1stl, 9/17 FGs. Augustus Gilchrist (MAH) - 34pts, 14rebs, 3blks, 1ast, 1stl, 13/19 FGs. The GlobalPort Batang Pier once again triumphed over Barangay Ginebra, handing the Kings another heartbreaker of a loss, 89-85, in a Valentine’s Day clash in the 2016 Oppo PBA Commissioner’s Cup at the SMART-Araneta Coliseum. 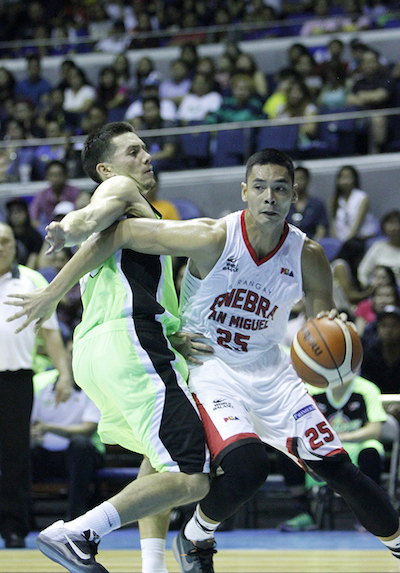 GlobalPort, which eliminated Ginebra in last conference’s playoffs in an overtime thriller, denied their foes a chance for some revenge as they proved steadier down the stretch in the endgame. Terrence Romeo led the way with 21 points – including a clutch three-pointer inside the final minute – while import Brian Williams bucked some second half foul trouble to finish with 19 points, 17 rebounds, and five assists in the win. Stanley Pringle added 14 points, and Billy Mamaril finished with 12 points. Japeth Aguilar tries to get around Keith Jensen. 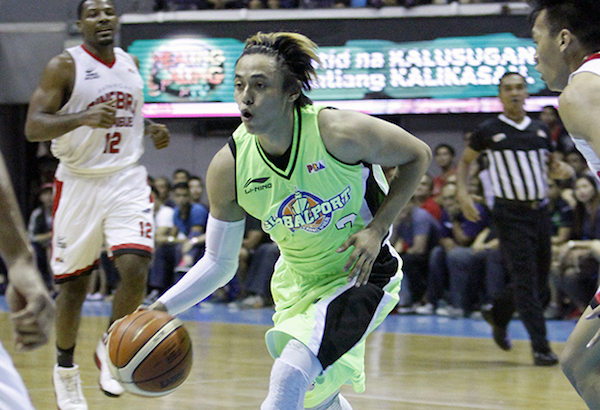 Terrence Romeo waxed hot anew for the Batang Pier. Greg Slaughter scored 20 points to lead Ginebra, while Japeth Aguilar added 16. 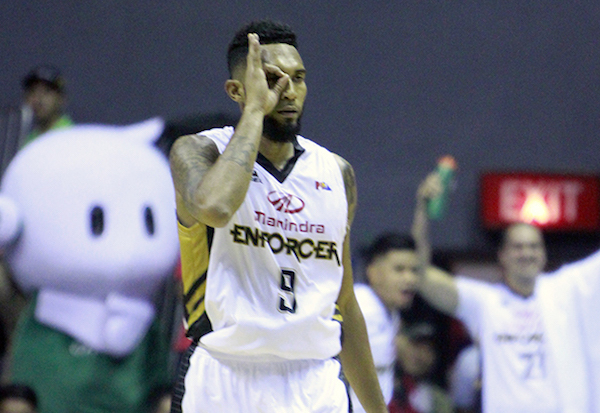 Import Othyus Jeffers, though, failed to reach double-figures in scoring, notching just eight points although he did have 16 rebounds and four assists. 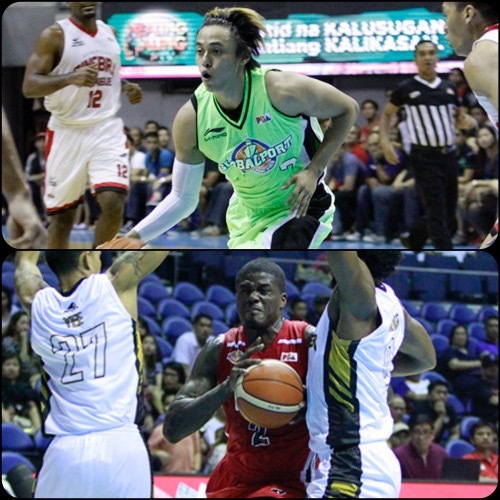 With the win, GlobalPort improved to 1-1, while Ginebra suffered a second straight loss to open the conference. Brian Williams (GLO) - 19pts, 17rebs, 5asts, 2blks, 6/9 FGs. Greg Slaughter (GIN) - 20pts, 7rebs, 1ast, 1blk, 8/16 FGs.